The Home of Harvest festival is Midlothian Castle, Burk’s Falls, Ontario, Canada which is 240km north of Toronto and 375km west of Ottawa. Midlothian Castle is the creation of Peter Camani, an artist / sculptor who created an unusual residence in the form of a castle complete with sculpture gardens on 300 acres which is most commonly known as “Screaming Heads”. With his paintings hanging in such coveted places such as the Vatican and Buckingham Palace Camani decided to focus his energy some 25 years ago till present on realizing a vision of significantly larger proportions and permanence. Today over one hundred “screaming head” sculptures each approximately 20 feet tall and weighing as much as 30 tons are ideally placed through the property along with the castle which has been featured many times on television including the CBC series “On The Road Again, Arthur Black’s Weird Homes, Driven By Vision, Shrines and Other Holly Places, World Of Extreme Homes, and MTV’s Cribs. Presently Camani is working on a film of his own entitled “Witch Way”. There has been no set release date but we should see its completion in the near future. 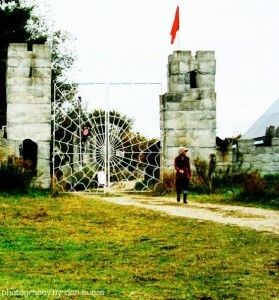 Peter Camani’s Midlothian Castle and “Screaming Heads” sculpture gardens are a truly magical and creative place that’s continually changing and evolving. It’s a perfect fit for our beloved Harvest Festival and it’s a place where all are welcome to explore throughout the year and create our own contributions to peter’s magical lands.